What is the cause of heel spur and heel pain? Old age: Especially people over 45 often have heelpain. Children: they sometimes suffer from heelpain for a limited time. This is not plantar fasciitis, but actually it is Sever Schinz disease. This is caused by sudden growth and usually disappears after 1 or 2 years. Standing still for longer period's. This is why sometimes heelpain is referred to as Policeman's Heel. Many sporters and especially athletes suffer from heelpain. Any activity which may cause stress and load for the feet can be an issue. Usually this is the jumping and running that we know from sports like basketball, volleyball, running, etcetera. Often badly trained people run more risks then those well-trained, so make sure you always build up your training. Another cause of overload is found with mountaineers. Walking uphill causes the foot and calf muscles to become stretched under stress and this can have a negative impact. If you suffer from heel spur and you still want to keep in shape, it could be wise to temporarily switch to sports like swimming and cycling, as these do not put too much load on the feet. Another major cause for plantar fasciitis is foot abnormalities. Especially flat feet and hollow feet often occurr. 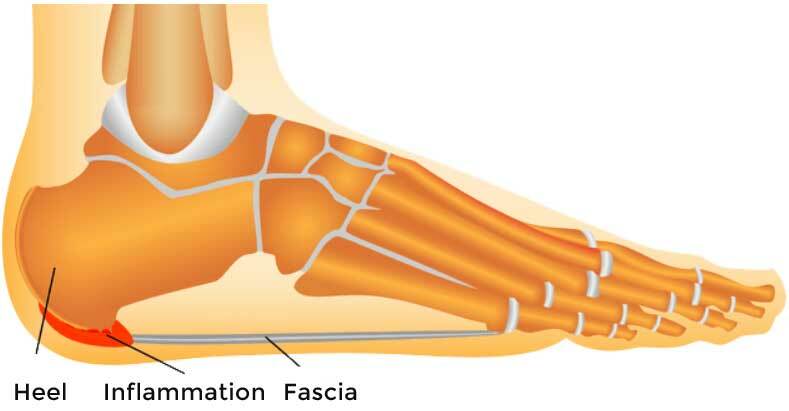 Both cause the foot to lean either inward or outward and this can cause abnormal stress on many area's in the foot, especially on the fascia. As a consequence, it may become irritated and inflamed. 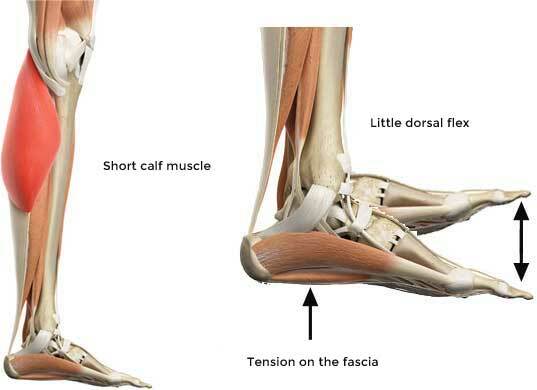 In the lower leg, the fascia is connected to the calf muscles, via the achilles tendon. Any problem in this area can cause issues and injuries. Especially people with plantar fasciitis often have relatively short calf muscles, either by nature, lack of flexibility or stifness. If so, a constant strain is put on the achilles and fascia tendons. This is often the main cause for heel spur.